At my last advanced agility class I had two dogs that came back after some time away from training. One of them had been absent for a few weeks and the other one for at least 3 months. It was great to have them back, and there where several things that made me really happy and grateful that I get to “work” doing something I love and enjoy so much. The first thing I noticed was that the dogs were THRILLED to be back! They had such a huge smile on their faces while they ran it made me smile. I love the fact that my teaching system allows the dog to have fun learning. The other thing I noticed was that the dogs remembered everything and the handlers were the ones that were rusty! This is funny because handlers coming back from a long break never fail to tell me, “I hope my dog has not forgotten his training” and I always respond: “I guarantee he remembers everything, it will be you who needs the refresher.” They always think I am lying but so far, the dogs have never proven me wrong! The other thing I enjoyed watching was the camaraderie between the handlers that had not seen each other in a long time! Agility is such a wonderful sport, it brings dogs and people together, we support and help each other while our dogs prove to us over and over again what wonderful, smart and loving creatures they are! This entry was posted in agility on July 12, 2012 by admin. Proper Socializing starts with the Breeder. I am always advocating for socializing dogs as early as two months old. I can understand that someone new to dogs might not fully understand the need to socialize or the terrible consequences of NOT socializing a puppy. But a BREEDER?? ?This past week I had the sad and troubling experience of a person bringing a young 9-month-old puppy to a group agility class with the intention of “socializing” it. This puppy looked so scared and upset and repeatedly lunged aggressively at all the other dogs in class. He also lunged at me when I tried to approach him in a very friendly and non threatening manner! Upon questioning the owner I found out that this puppy had been kept by the breeder until two months ago when this naive person bought it! What is worse, the breeder told her all the dog needed was to practice his “social skills”. This poor dog needs some serious and intensive behavior modification rehabilitation. What worries me even more is that the owner truly believed there was nothing wrong with this puppy and that her repeated exposure to other dogs would magically “cure” him. When the dog lunged at me she wholeheartedly reassured me: “He is fine around children! I take her to school and the kids can pet him”. Chills run down my spine… you have to be kidding me! This puppy is a time bomb and this inexperienced person is putting innocent children and dogs at risk. This greedy breeder, who only cares about selling dogs and not the welfare of the puppies she brings into this world, is the reason why we have all this punitive breed and breeder regulations! This irresponsible breeder is the reason radical groups like PETA exist! If you are getting a dog from a breeder please make sure it has been properly socialized and ask to meet the sire and dam. The only way to stop irresponsible breeders is let them deal with the maladjusted dogs they breed and not allow them to dump them on good people. Don’t buy puppies from Flea market vendors, the internet or backyard breeders. You will just be promoting more suffering. There are enough dogs in shelters and there is enough cruelty towards all the poor animals that have to be euthanized because of behavior problems. When you get a puppy: SOCIALIZE, SOCIALIZE, SOCIALIZE the instant that puppy comes into your life! 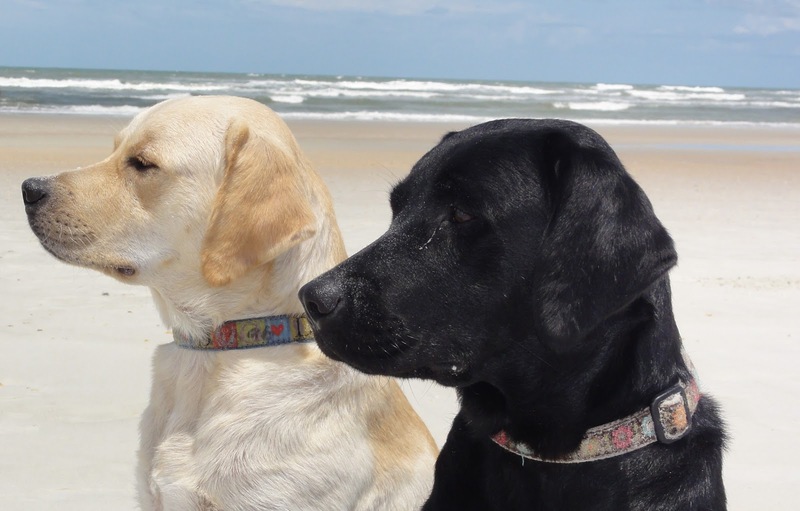 This entry was posted in Puppy Socializing, training on July 5, 2012 by admin. It’s hard to believe! Oliver and Amelia have turned two! The memory of the super soft fur, tiny ears and puppy breath still lingers in my mind. While watching them play in the littler box, I used to wonder how they would be when they grow up? I also remember all the planning, socializing, natural rearing so they would grow into smart, loving and healthy dogs. Let me tell you that even though they were raised in identical conditions, they have turned out to be my YING/YANG pair! Oliver is the best dog one could ever hope for: loving, obedient, smart, eager to please, an awesome retriever and swimmer. The icing on the cake is that he is also a handsome dog. When we go to agility trials, he has a fan club of admirers that come to pet him and comment on how gorgeous he is. As a proud mom, I could not be happier and more grateful. Amelia, on the other hand does not come to the trials with us. Why? First of all she is not even close to being ready to compete and second she is a HANDFUL! Amelia has one and only one mission in her life: cram the most amount of fun into the shortest amount of time! She wants your undivided attention all of the time, she wants to play, chase, run, steal anything remotely edible, hoard all the toys, jump on you, bug the other dogs and sleep on top of you. All of this done with at least three times the force a “normal” dog would use leaving everyone involved bruised and exhausted. She had her own B-Day party by jumping on the dining room table, stealing a Blueberry marmalade jar (glass of course), taking the lid off and eating it’s contents until it was not even sticky anymore. Maybe the lesson in this is to be grateful for the awesome things in your life and love everyone for their own uniqueness. Let’s face it, training during summer in Florida is a bummer! I find myself procrastinating and getting distracted with ten other things before I make myself go out and do something with my dogs. I play this quote in my head, over and over again: “You can have what it is you want or you can have your excuses for not having it.” Very powerful…still so hot out there. Ok, Lilianne you need a plan. We will train a minimum of 3 times per week, very specific exercises, each practice short and sweet (and hot). We just need to practice the weave poles, not even all 12 poles just correct weave entry. How hard is that? just 2 poles, I will send each dog 3 times. I will do a couple of simple one-jump exercises (Linda Mecklenberg’s jumping system is my favorite); that will keep the muscles they need for jumping in shape. Amelia and Oliver need to work on their running contacts. I am experimenting with this new (for me) method and it looks like they are fast learners but you need to get out an do it! Today I made it! After putting it off for a couple of hours, my guilt level rose to the max as I had left Holly, Amelia and Oliver in their crates in the garage after giving them their breakfast and promised them that after tending to just one urgent stuff, today we would train! So armed with some super high value treats (tripe and meatballs) which I think is the doggie equivalent to a Mint Chocolate Chip Ice Cream (which is my idea of a high value treat if I was to work in this heat), we trained, the dogs had a great time, were really eager to work for the super yummy treats and I am sure I sweated at least one pound off. Maybe I should get a scale and weigh myself after each session, that might keep me motivated! This entry was posted in humor, stories, training on August 3, 2011 by admin. This is so true and because I am raising two puppies, I can assure you this stops being funny! I open the door to the garage to put out the trash and both puppies rush out, get one in, the other stays out and plays hard to catch, I finally get it and when I open the door to get it in, the other comes out! They could play this game all day but I start to get exasperated. A fast and fun solution is to teach them the “Touch my hand” game. It’s very easy, and the puppies love it. 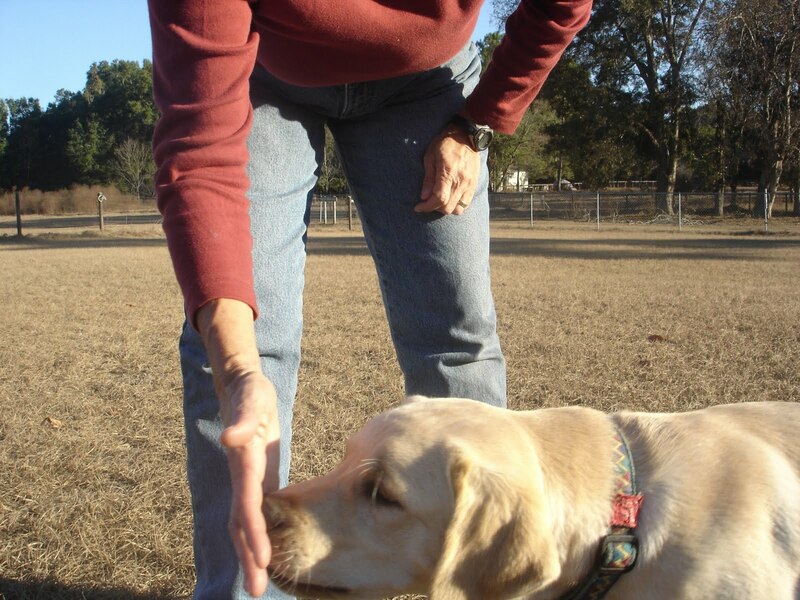 You start by placing the palm of your hand about 3 inches in front of your dog’s muzzle. Out of curiosity he will approach to smell and quite possibly touch it. When he does so, readily “mark” the behavior with an enthusiastic “YES!” and immediately give him a treat. The key is to get him to actually touch your palm. Because puppies are usually always interested in food, you can practise 5 or 6 times in a row gradually increasing the distance he has to move towards your palm. Now you can use your palm to get your puppy in or out and to stay on the side of the door YOU want him on! Below is sequence of photos that will help you see the training process. 1) If he does not actually touch your hand rub the treat on it first. 3) If he insists on smelling the hand that holds the treat, put it behind your back and hold your palm right in front of his muzzle. 4) Remember to “mark” the touching with an enthusiastic YES! followed immediately with the treat. This entry was posted in Games, Puppy Training on March 24, 2011 by admin. We did it! 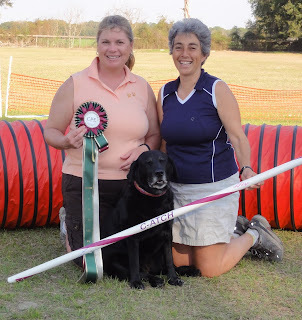 Sabrina and I finally got our long awaited CATCH (CPE Agility Trial Championship). For those of you who are not that familiar with the Agility jargon, a CATCH involves getting at least 94 qualifying runs in at least 3 different levels (ascending in difficulty) in 7 different classes. When you get your CATCH, you are awarded a humongous rosette and a bar. Yes a PVC bar just like the ones that are used on the jumps. You run a victory lap around the ring holding your bar and afterwards all your friends sign it. I know, it sounds silly but it is a huge thrill! Since Sabrina celebrated her 10th Birthday last September, she was experiencing the normal slowing down and “creaky” joints; so for the past year we had been doing limited showing just competing in one or two classes instead of the usual five per day that are the norm at CPE agility trials (CPE stands for Canine Performance Events, one of several organizations that offers agility trials). As would be expected, the closer we came to earning our title, the more elusive it became! I lost track of how many “almost perfect” runs we had where one little mistake, usually my fault, would cost us the coveted “Q” as we call a Qualifying run. I must admit that some days I just wanted to throw my arms up in desperation and quit. To add on to the stress, Sabrina started being lame on and off because of a cronic injury that I think is related to her jumping a gate to get to the store and steal samples of dog food. Typical Sabrina…We keep several different samples in baskets under a table and she just picks the Pheasant and Brown Rice! So now we are adding quiropractic adjustments, accupunture, Chinese herbs, massage, supplements, icing, you name it we have tried it! So when the thrill of the win is over and the photo and rosette have faded, my heart will still be joyful for the happy runs we had together. Sabrina, you are the BEST! This entry was posted in agility, competing, CPE, stories on March 8, 2011 by admin. Last weeks homework was for you to reward your dog many times for looking at you whenever you said his name. You see, if you say your dog’s name and he does not even turn to look at you, there is no point in calling him because he is NOT going to come; so you are just practicing the wrong behavior over an over. I like to teach my dogs to come by playing a series of games. This not only makes it fun for both of us, but it also teaches him that coming to me is better than any other thing he is doing. When competing with very distracting stimuli, like a squirrel, or the neighbors horses, dogs or cats, I really need to make it worthwhile for him to stop the chase and want to come to me. Fun games are a great way to do this. One of the first games that I play with Oliver and Amelia is called a restrained recall. I ask someone to help me by holding one of them by the collar ( I use a buckle collar, not a choke collar or any other type of correction collar), while I run away from him hooting, hollering, waving and acting very silly. At this point he is pulling trying to break way from the person holding him to chase after me. I will then turn around, kneel down and call him “Oliver COME! My helper will now let him go and he will come like he has been released out of a sling shot, running full speed towards me. All this time I will be praising and smiling. When he gets to me I pat him, shower him with praise and also give him super yummy treats. We can usually repeat this 3 or 4 times allowing me to increase the distance that I run away from him. 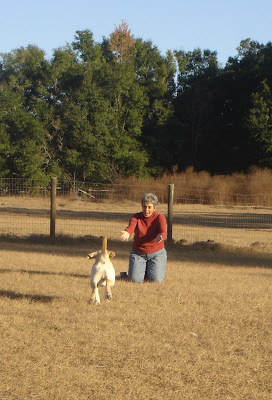 Since we live on a farm, my dogs can wander a few hundred feet from me, so I make it point to practice right from the beginning to come to me from a good distance. I will continue to practice giving him a treat whenever say his name and he LOOKS at me; this is really the first step to a truly reliable recall, if I can get his attention, I greatly increase the probability of him actually coming. 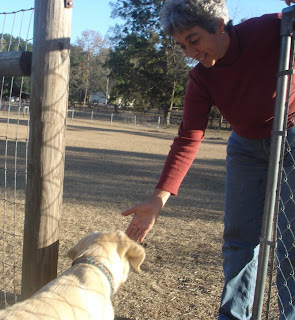 This entry was posted in Come when called, Games, Puppy Training on December 2, 2010 by admin. 4) Pretend they didn’t hear you. No matter how many times you explain that if you call them is because you want them to come, you will invariably get one of the responses above. I have news for you, your dog is your kid. One of the most common complaints I get from dog owners starting a training program is: “He does not come when I call him”. The expectation is that I will wave my magic trainer wand and install on your dog a come when called key just like the ones on your TV remote control. I have more news for you. Coming when called is not a built in feature in your dog. You have to TEACH him to come. Almost everyone’s attempt at teaching their dog to come are: to call him, and then call again, then again and again with the voice level escalating rapidly and then adding in some frustration and anger. Needless to say, if a raging person was yelling for me to come to them, I would seriously wonder if that would be a safe thing to do! Well, your dog is no different. To top it off, the consequence of coming is usually something “bad” from the point of view of the dog. For example, he was out running around having a grand old time sniffing, chasing a squirrel, barking at the neighbors cat, dog, kids and now you spoil all this by having him come in and end the fun! To teach your dog to LOVE coming to you, you have to convince your dog that coming to you is the best thing that he could think of doing. Some good starting points are: using a pleasant and inviting tone of voice, calling your dog for things he enjoys, like mealtimes, walks, belly rubs and cookies. If you have to do something “bad” from the DOG’S point of view, then go and get him, snap the leash on and take him with you as opposed to calling. Yelling “Come” a million times when you know your dog is not going to respond is teaching him that he can ignore you. I you would like to polish your dog’s recall skills, do the following homework during the next week. Write down how many times you call your dog for pleasant things versus unpleasant things. If the unpleasant outnumber the pleasant, you will know why your dog refuses to come to you in the first place. Remember pleasant is defined by the dog not you. Carry treats in your pocket and reward your dog with one every time you say his name and he stops what he is doing to LOOK AT YOU, add some lavish praise too. Resist the temptation to call more than once or even better do not call at all if you know your dog is very distracted and the probability of him obeying you is close to zero. In next weeks post I will give you more homework and additional exercises for you improve your dog’s recall skills. Until then, happy training! 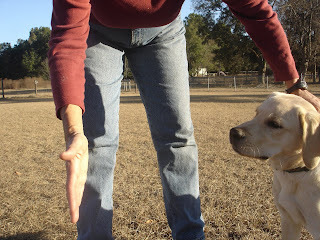 This entry was posted in Puppy Training, Teaching Come, training on November 30, 2010 by admin. I observe Amelia’s paw as she tries to climb all over me while I try, unsuccessfully, to take a power nap. I cannot but stand in awe at its perfection: round, pitch black, all the shinny little hairs arranged in orderly lines, covering it like a bonbon covered in melted chocolate. How can this little paw harbor so much strength? Even her nails are shiny, hopefully a consequence of her Raw Diet and the Salmon supplement she gets everyday in her food. I am proud of the good job I have done about keeping them short. I am now a little nail obsessed since my vet told me how important nails are in sending signals to the brain for balance, proper body posture and prevent injuries –very important for my agility hopeful. Then I look to my right, where Sabrina who just turned 10 years old, is huddled up to me. She sneaks up on to the supposedly forbidden couch when I take power naps. She is sound asleep, doing a much better job of ignoring Amelia than I am. For an instant I am saddened by her paws, also round, shinny and beautiful and now sprinkled with lots of white hair, getting creaky and a little painful with every year that goes by. I quickly force the thought out of my head, as I know she can hear me. Focus on the good times, I order my brain. It is the natural law of life, maybe a glimpse of my own aging. How many times have I wished, for a slimmer body, faster legs and less pain in my feet. I wish I had started running in Agility when I was younger. 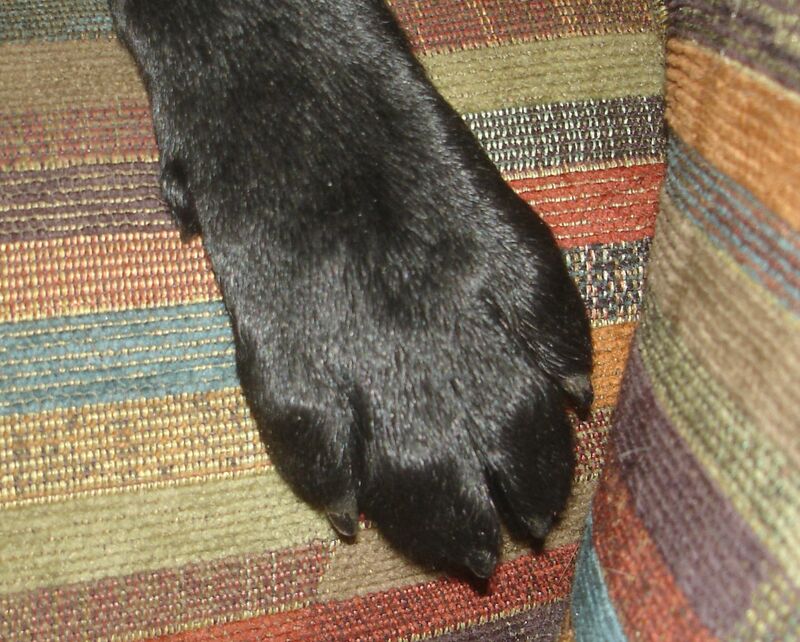 Maybe I am the one who is jealous of those perfect puppy feet? But the passing of time makes us who we are today, hopefully wiser. So for right now I will look back at our journey with my dearest Sabrina, slowing down but still looking at earning the coveted Agility Trial Champion title, we are just 2 qualifying runs away. She has taught me most of what I know in Agility and thanks to her, the ones that I have trained after her have had the privilege of not having to endure my training mistakes. Thank you Sabrina. We hug each other tighter. And that persistent little paw that won’t let me nap is a glimpse of the new exciting journey that lies ahead. Happiness is a journey, not a destination. This entry was posted in stories on November 8, 2010 by admin. When I decided to start writing a Blog, I did some research to find some tips on how to get started. There is no shortage of advice out there, but one thing was mentioned by ALL sources: Decide how often you want to write and BE CONSISTENT, because your followers will be expecting it, so don’t disappoint them. This made perfect sense I thought, it is just like dog training. Be consistent, don’t change your commands, don’t give commands you cannot enforce, don’t set up your dog for situations that are more distracting than what you have trained. Consistency is the key to your dog understanding that you really mean what you are asking of him. You confuse your dog when you are constantly varying your criteria and you have to be consistent with your training schedule to see improvement. So I decided I would post once a week. I could write during the week, revise it over the weekend, get input from my family and post Sunday night or Monday morning. It would be a nice treat for my followers at the beginning of their work week. Well, I got a taste of my own medicine with this blog writing business. I caught a cold that took two weeks to go away, then we hosted an agility trial that left me exhausted, then…opps, I am out of excuses! I have not posted since October 11. I simply procrastinated and voila, I wrote nothing for a month. I even forgot that I had outlines for not one, but two Blogs! So many of my students come to class and sheepishly admit: “I did not train at all this week” and you know what is always so amazing? The dogs have not forgotten but the owners are so rusty. So they forget to BE CONSISTENT and then the dog starts getting confused and performs poorly. So let’s renew our vows together! I will start typing away and you will pick up your leash, load your pocket with treats and get out and train. Your dog will love it and you will feel so much better too. It is so easy to BE CONSISTENT! I am working on my next two posts. I will be on time, will you? This entry was posted in training on November 8, 2010 by admin.